All Photos by John Peden. Eric Clapton’s The Fool. A name immediately recognizable to guitarists, yet baffling to others. 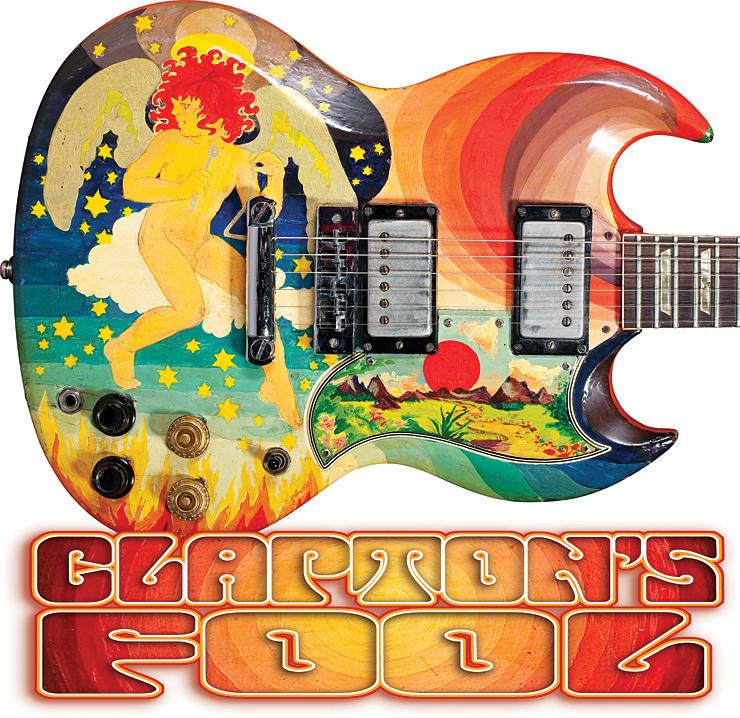 What is Clapton’s Fool? Very simply, it is one of the most important and famous electric guitars in the history of the instrument. In the hierarchy of guitars, the bottom of the pyramid’s capstone is made up of guitars that are “merely” highly collectible, the best example being the 1959 Gibson Les Paul Standard, of which there are hundreds. Next up the pyramid are stage-played instruments belonging to well-known artists, often accompanied by pictures to ensure there is no doubt, such as one of Jimi Hendrix’s Stratocasters. At the pyramid’s apex are the rarest of rare – the unique instrument that is not only a visual and sonic signature in itself, but is readily identified with an artist of the very first rank, over a period of time, in many songs – a guitar that made anthemic songs played every day and has attained status as a cultural icon – in other words, a guitar that actually made history. • Visually: The first picture-painted guitar in rock and roll, it radically changed the concept of guitar from instrument to art object – the first “art guitar” created by artists. • Culturally: It’s one of the leading cultural icons of an age, one of the first embodiments of psychedelia, and one of its most striking realizations ever. It evokes the most magical years of the mid/late ’60s, with its innocent love-and-drugs culture and the first supergroup, Cream. Clapton’s Fool started life as an SG. For many years, some speculated it was a ’61 SG/Les Paul, but the proper view came to be that it is a ’64. A primary bit of evidence is the pickguard, which has six screws as the later years’ pickguards do, rather than the earlier five screws, as was standard on the ’61 SG/Les Paul. In addition, it has patent-number pickups, not the earlier “Patent Applied For” pickups Gibson ceased using circa 1962. The guitar was purportedly originally owned by Beatle George Harrison, who gave it to Clapton circa ’65, after Clapton’s ’59 Standard that he had been using in Cream was stolen. Clapton had just left John Mayall’s Bluesbreakers to form Cream with Jack Bruce and Ginger Baker, having so stunned his audiences with his performances that the graffiti “Clapton is God” became visible throughout London. The band’s first album, Fresh Cream (1966), lived up to its name – it was a three-man group composed of players already individually recognized as members of other bands, and it played a repertoire that bore more in common with blues roots figures such as Robert Johnson, Muddy Waters, and Albert and Freddie King than with the then-typical “British Invasion” music. During its brief existence, Cream stood for continued innovation – one only had to observe Clapton’s hair evolve from his early “Brutus cut” on the cover of Fresh Cream to “Afro-man” perm to “college hippie” over a two-year period, with wardrobe changes to boot! In ’66, Cream was making plans to go to the United States the following year – 1967 – the year of “the Summer of Love.” Murray the K, the WOR-FM disk jockey in New York, was organizing a week-long, never-to-be-seen-again, all-stars/all-hits revue. Cream knew its debut had to have maximum impact on their new American audiences, so they enlisted the help of a pair of then-obscure Dutch designers who later became an art group known as The Fool, who were to play an important role, in rock and roll, and more broadly, in the psychedelic culture of the late ’60s. The Fool began with two members, but eventually grew into a collective; its core members were Simon (a.k.a. Seemon) Posthuma, Marijke Koger, and eventually, Josje Leeger, Koger’s art-school friend. Others, particularly photographer Karl Ferris and Barry Finch, were also associated with the group. Posthuma and Koger, who met circa 1961 and a few years later began participating an “alternative” Amsterdam boutique called Trend, were living on the island of Ibiza (off the coast of Spain) before relocating to London in early ’66 with a grant from the Von Pallandt Foundation. There, they sold posters to the galleries and boutiques around London. They also began to design clothing and other things for leading rock bands such as The Beatles, The Hollies, Procol Harum, The Incredible String Band, The Move, and others. One weekend, they painted the three-story mural on the side of The Beatles’ Apple store in London that delighted their fans – and so outraged local merchants that only three months later, the Westminster city council issued an edict that it must be painted over. They designed many other famous items, including George Harrison’s fireplace, the original album liner for Beatles’ Sgt. Pepper album, and others. It’s often thought that The Fool painted John Lennon’s famous Rolls-Royce, though in fact it was painted by the same gypsy painters who painted a gypsy wagon Lennon kept in his garden, after Koger spied it and gave Lennon the idea. The origin of The Fool’s name was from the Tarot card Arcana Zero, which shares a name with a wild trump card. The Fool card, Posthuma said, “represents Truth, spiritual meaning, and the circle which expresses the universal circumference in which gravitate all things.” The Fool were not merely artists – they designed their own costumes, and made quite an entrance wherever they went, with their splashy, hippie-gypsy style. Eventually, The Fool even formed a band and released a few singles, along with at least one eponymously titled ’68 album on Mercury Records (produced by Graham Nash). Ginger Baker once remarked that Koger was the best tambourine player he had ever heard. They also were the driving force behind the ’60s psychedelic classic movie Wonderwall, in which they act and which was named after a Fool-painted armoire and bust in their apartment that served as Lennon’s inspiration to hire them in the first place. Before ever meeting the Beatles, however, Koger and Posthuma were commissioned by Robert Stigwood, Cream’s manager, to work their artistic magic on Cream’s instruments and costumes. Simon Hayes, then-owner of Mayfair Public Relations agency, was a friend of Koger and Posthuma. Mayfair (where Finch also worked) represented the Saville Theatre, owned by Brian Epstein, the Beatles’ manager. It was Koger’s commission to create a poster for the Saville Theatre’s Sunday night rock concerts that indirectly led to the Cream commission. Stigwood, often broke but never poor, needed to promote the band’s upcoming American tour in a bold and different way. Having seen the poster for the Saville Theatre, Stigwood was very intrigued, and through Finch set a meeting with Koger. He gave her a commission to create costumes, graphic promotional material, and when she suggested that she paint the instruments, those, as well. The Fool disbanded as a group in about 1970, leaving Posthuma and Koger, who were married for a time, to continue as a duo. After leaving London, Posthuma and Koger relocated to Hollywood, where they painted the exterior of the Aquarius Theater on Sunset Boulevard for the 1968 production of Hair. Today, Posthuma is based in Amsterdam and Koger is based near Los Angeles. Finch and Leeger married on the day Americans landed on the moon, had six children (each named for a color) and remained together until her death by stroke in 1991. Koger and Posthuma took Clapton’s SG, and after having it sanded and primed, applied their design by hand, using oil-based, brush-applied enamel paints. The theme of the guitar’s design is, broadly, good versus evil, heaven versus hell, and the power of music in the universe to rise above it all as a force of good. A clue to this is found in a quote from Koger’s web page (maryke.com/fine.html) explaining her fascination with themes she has used throughout her artistic career. On the face of Clapton’s Fool, a cherubic angel holds a triangle in one hand and the triangle beater in the other, sitting high in a celestial sphere. Yellow hexagonal stars (signifying the cosmic spirit, according to Posthuma) against a blue celestial sky (a Fool hallmark, still in evidence on Koger’s website) form part of the background. Below, flames lick upward from the lower treble bout toward the Volume and Tone controls and beyond. The angel looks back toward the lower bass bout and a rainbow-painted set of arcs – the Fool’s trademark, according to Posthuma. The inspiration for the angel was in no small way influenced by Clapton’s permed hair at the time, according to both Koger and Posthuma. The back of the guitar is a set of concentric, rainbow-gradated circles that start in the center with yellow, and end with deep red on the outside. Outside the circles are waves of brightly-hued, contrasting colors. According to Koger, Posthuma was responsible for this part, as well as the corresponding “circle of light” on the back and front of Jack Bruce’s Fender Bass VI painted at the same time by The Fool. The neck and headstock are painted in psychedelic rows of bright-colored, wavy stripes. The truss-rod cover is a white plastic laminate. Though many have speculated otherwise, the entire fretboard was never painted – a fact confirmed by Koger – and pictures of the guitar in this state have not been found. Clapton may have removed some of the paint on the back of the neck, which was flaking due to the fact it wasn’t clear-coated or sealed, and the high wear he was giving it. When, and by whom, the back of the neck might have been repainted are still a mystery. The pickguard has an entirely separate scene – a picture within a picture, almost a Dutch miniature. Though it, too, was painted by Koger, it has a different style – a pastoral landscape with a path in the foreground leading into the distant hills, with a red sun overhead and plants and scenery all around. According to Koger and Posthuma, it represents Paradise. “The pickguard was painted by me. I was, and still am, intrigued by the idea of paradise which the landscape on the pickguard represents,” said Koger. 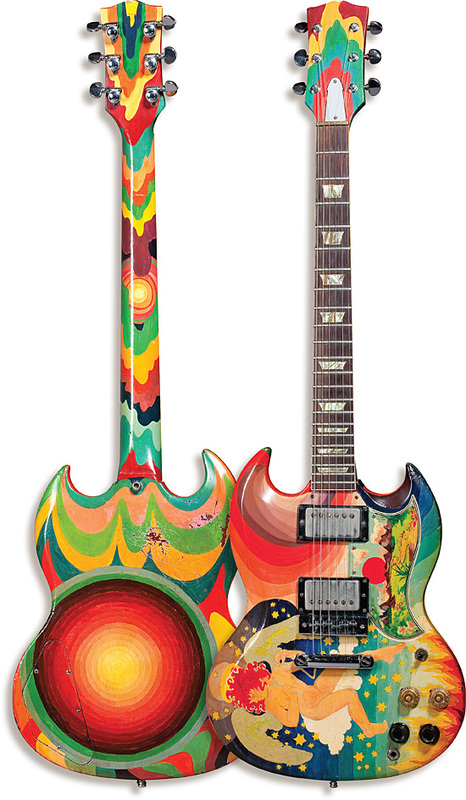 The guitar – along with Bruce’s bass and Ginger Baker’s bass-drum head, both of which were also largely designed by Koger – was painted over a span of two weeks. The Fool also produced costumes, graphic designs, a booklet illustrated with Koger’s art, photographs of Cream, and poems by Finch. 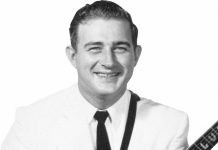 Murray the K served as promoter on revues with some of the leading acts of the day, with shows lasting about 90 minutes, and repeated (in principle) five times a day. Each act initially was allowed to play two to three songs. At the spring, 1967 “Music in the Fifth Dimension” revue, two new acts – The Who and Cream – were to be introduced to the American public. It was slated for Saturday, March 25, through Sunday, April 2, at the RKO 58th Street theatre in Manhattan. Due to the lack of familiarity of American audiences, neither Cream nor The Who were headliners. Rather, Mitch Ryder headlined, with Wilson Pickett and Smokey Robinson (who never actually appeared) seconding. Cream (billed as The Cream) and The Who came next in the billing, “Direct from England.” Cream was initially scheduled to perform two songs in each show, “I Feel Free” and either “I’m So Glad” or “Spoonful.” However, the logistics of cramming 10 acts into each 90-minute show soon took over, and they were “encouraged” to perform only one song, “I Feel Free,” and even then were told to cut its length so the next act could take the stage on time. Cream’s U.S. debut was also the debut of Clapton’s Fool and the rest of the Fool-painted gear, and it’s said the paint was not fully cured by the time of the concert! 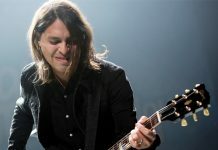 Several commentators have written about how the audience was taken aback by the band’s appearance, including their instruments and costumes, as well as their stunning new music. Clapton’s Fool was his principal guitar for most of the work that followed Fresh Cream. The ensuing albums, including Cream’s Disraeli Gears, the world’s-first platinum double album, Wheels of Fire, and Goodbye, are infused with the sounds of The Fool. Disraeli Gears was largely recorded at Atlantic Records studio in New York City in early May of ’67, produced by Felix Pappalardi and engineered by Tom Dowd. It includes the defining Cream song, “Sunshine of Your Love,” and other signature songs such as “Tales of Brave Ulysses,” and “Strange Brew.” Wheels of Fire contained a broader, more adventurous set of songs, but included “White Room,” “Politician,” and perhaps the most-copied song in any blues band’s repertoire, “Crossroads.” He used The Fool regularly, though less exclusively, until the end of Cream in November ’68. These albums and recordings are remarkable for many reasons, but one of the most notable is Clapton’s introduction of “woman tone” – one of the most soughtafter sounds ever made by an electric guitar. Clapton began developing and refining this sound initially on his Les Paul, but it did not reach full flower until he switched to The Fool. 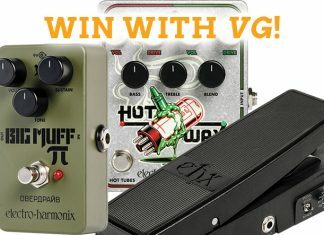 What is “woman tone?” Though subjective, it could well be defined as a guitarist’s version of “vox humana,” a tone that sounds like a woman singing “ooooh” softly and with a healthy dose of vibrato. In an interview in the August ’67 issue of Beat Instrumental, Clapton described his style and tone, saying “I am playing more smoothly now. I’m developing what I call my ‘woman tone.’ It’s a sweet sound, something like the solo on ‘I Feel Free.’ It is more like the human voice than the guitar. You wouldn’t think it was a guitar for the first few passages. It calls for the correct use of distortion.” Clapton illustrates the technique using The Fool in a 1968 interview that can be seen at vintageguitar.com/special-features. 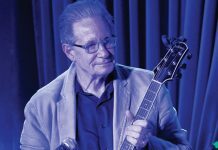 In the interview, he illustrates the various tonal possibilities, and demonstrates the wah, all the while using his customary Marshall stack while Jack Bruce looks on approvingly. The opening riff and solo of “Sunshine of Your Love” are arguably the best illustrations of full-blown woman tone. 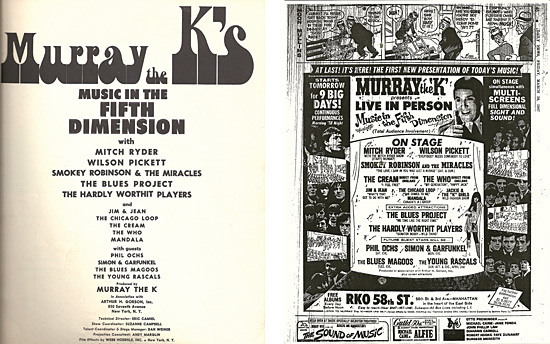 (LEFT) The handbill for Murray the K’s “Music in the Fifth Dimension” revue. (RIGHT) Murray the K ran this ad for his “Music in the Fifth Dimension” revue in the March 24, 1967, edition The New York Daily News. There are several stories about what happened to the Fool after he stopped using it in Cream. 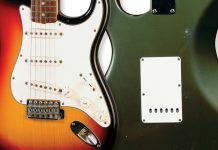 All we know for certain is that the guitar left Clapton’s hands, passed through the hands of Jackie Lomax into the hands of Todd Rundgren for nearly 30 years, who then sold it at auction in 2000. In one version, in early 1968, Clapton left the guitar with George Harrison, and never returned for it. Then, around the middle of ’68, Harrison “loaned” the guitar to his friend, Jackie Lomax, a “Merseybeat British Invasion” guitarist and singer/songwriter who bounced around in early-’60s bands in the U.K. In ’71, Lomax moved to Woodstock, New York, to try to crack the American market yet again, this time under a Warner Brothers contract. He met Rundgren at a recording session, and let it be known that he possessed Clapton’s Fool (see sidebar on Rundgren). When Rundgren received the guitar from Lomax, the wood of the upper neck and headstock had deteriorated because of playing wear, sweat, or through simple neglect. Wanting a playable instrument, Rundgren had a portion of the neck and headstock replaced. Today, the exact spot of the repair is only slightly visible, and it was repainted to a near-exact copy of the original. In addition, Rundgren had the body coated with a sealant that better protected the oil-based enamel paints, and retouched some of the missing paint. Today, The Fool is in the same condition as when Rundgren last had it. Its tuners are Grovers, replacing the original double-ring/single-line Klusons. The nut is brass, not the original white celluloid. The neck, from the nut down to about the third fret, and the headstock, are new, having been repainted to look like the original. No serial number is evident. The instrument appears to have a clear coat except on the headstock, which has a noticeably duller sheen. The bridge is a Gibson Nashville-style Tune-O-Matic, with a stopbar tailpiece. There are many pictures of Clapton playing the guitar with a trapeze tailpiece, and with a Gibson Maestro vibrola tailpiece that was the standard for the time. The pickup switch and pots appear to be original, while the control knobs have likely been replaced. Playing The Fool engages all the senses. It’s difficult to approach playing the guitar objectively, given its iconic status. First, it is so clearly different in appearance from any other guitar that one must be prepared for a new level of physical instrumentality. It smells old – not bad – just old. To the touch, the rippled effect of the hand-applied paint gives it a more-organic, less-manufactured feel. The neck has extremely low action and the frets are low and wide. On the spectrum of Gibson necks, from 1961 wide-flat to 1965 “baseball bat,” The Fool is somewhere in-between, but closer to wide-flat. This may have been original, but could also have resulted from repeated neck sandings or treatments over the years. The knobs turn with ease – not surprising, given the usage. Plugged in, the guitar plays like any other, at least at low volume with its controls turned fully up. Naturally, the temptation to crank the amp and dial back the Tone controls takes over, and one begins to hear the difference. 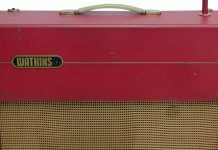 When one turns up the amp to at least 7, things begin to happen that take it out of the realm of the ordinary; the tone begins to thicken, compress, and sustain. 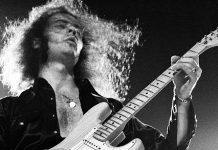 It’s often said that a guitarist’s tone is in their fingers, not the equipment. But here, it’s clear the equipment helps, to put it mildly. A few riffs are in order, starting of course with “Sunshine,” the classic tone of the axe is obvious. The temptation to finish with “Crossroads” is irresistible. Today, The Fool is in good condition and in a very safe place in the possession of its online buyer. For a portion of its life, The Fool, Eric Clapton’s famed Gibson SG, was in the possession of renowned guitarist/songwriter/producer Todd Rundgren (VG, August ’11). There has been much speculation about how Rundgren came to acquire the guitar from Jackie Lomax, its condition at the time and in subsequent years, what he did to restore it, and even the number of replicas that were commissioned by him. We posed the key questions to the man himself. Do you remember approximately when you met Jackie Lomax? I think it was in Woodstock, while [producing] The Band’s Stage Fright record. I really didn’t know Jackie that well, but he was living in Woodstock and someone said, “You want to go over and meet Jackie?” And, I’m not sure, but I think he was already looking for someone to buy the guitar, because I only really met him that one time and the first thing he did was get out The Fool. It had been horribly abused by that point, it was in terrible shape. He had been using it as a lap guitar. Original hardware down to the bridge was gone – he had a wooden bridge on it. The action was a mile high. Was the neck bent then, too? The neck was all beat up, especially near the headstock. Eric had played the guitar so much that he had worn the finish off the neck, so it was just bare wood and was rotting, essentially, because so much sweat had gone into the wood. It was like balsa wood at that point. I played the guitar for a while and eventually, the headstock just snapped off, so I had to have that reattached. That eventually was replaced, but if the guitar was going to be played, I had to repair it. And the original paint had never been sealed – they used, like, acrylic paint, but never put sealer over it, so bits of paint had been falling off over the years. Was that touched up at some point? I got an artist friend to restore the paint job and seal it so that it wouldn’t fall apart anymore. Plus, I had to repaint the back of the neck since it had been replaced. I did a little work just to keep the guitar from turning into a pile of lumber. What do you remember about acquiring it from Jackie Lomax? Well, Jackie was not known as a great guitar player, so it seemed to me the instrument had been completely orphaned by everyone who owned it. He was desperate for money or something and said, “Give me $500 for the guitar and maybe someday I’ll buy it back from you.” I didn’t hear from him again until sometime in the ’80s, when he showed up at a gig we were at in L.A. and wanted to buy it back. Of course, by that time I had invested thousands in restoring the instrument. At the time, Sothebys was just getting into online auctions and wanted to include the guitar as part of one. It got two bids over the minimum asking price, which was way below what Brownie sold for, and we’d expected it to go for at least as much. But I’d told Eric that if I ever did sell the guitar, I would contribute 10 percent of the proceeds to his clinic, which we did. So I gave him 10 percent and gave the rest to the I.R.S. (laughs)! And you had a replica made, right? Text and photographs all rights reserved, 2011. This article originally appeared in VG December 2011 issue. All copyrights are by the author and Vintage Guitar magazine. Unauthorized replication or use is strictly prohibited.